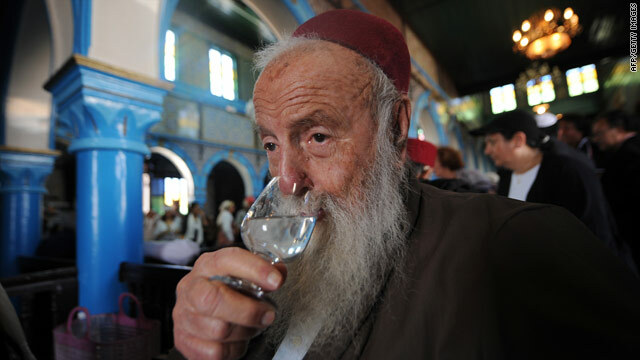 A rabbi drinks a glass of fig alcohol at the 2010 pilgrimage to Derba, a Tunisian island. (CNN) - The political tension bubbling across Tunisia, Libya and the rest of North Africa has forced the cancellation of an annual Jewish pilgrimage to a historic synagogue on the Tunisian island of Djerba. Roger Bismuth, a leader in the Tunisian Jewish community, said the community is concerned about the possibility of disruptions amid the ferment in Tunisia and the warfare in nearby Libya. "We are scared people will take the opportunity to do something," said Bismuth, leader of a community that endured a deadly 2002 al Qaeda truck bombing in Djerba. "It's irresponsible to do it." The annual pilgrimage is always held around the Jewish holiday of Lag B'Omer, which comes this weekend, and it is centered on La Ghriba, a revered and iconic synagogue in the heart of the island. It was targeted in the 2002 attack, which killed 21 people, including German tourists. According to legend, Jews came to Djerba after the destruction of the first temple in Jerusalem, destroyed in 586 BCE, and the synagogue has foundation stones from that edifice. Many of the people who attend the pilgrimage are Tunisian and Libya Jews living in France, Italy and Israel. But Israel's National Security Council Counter-Terrorism Bureau has recommended that Jews and Israelis refrain from visiting "in light of the intention to perpetrate revenge attacks following the elimination of al Qaeda leader Osama bin Laden." Jerry Sorkin, who operates the Philadelphia-based TunisUSA, a tour company that specializes in cultural and historical tourism, called the cancellation a "prudent" move. Speaking from Tunisia, he told CNN that tourism is down "tremendously" in the region and security is a concern. "There are people in Tunisia who are bearing the brunt of the revolution," he said. "Is it the time to be celebratory?" Lag B'Omer, which starts Saturday night and goes into Sunday, is a minor but joyous holiday on the Jewish calendar and is widely observed by Orthodox Jews. It falls between Passover, which recalls the Exodus of Jews from Egypt, and Shavuot, which celebrates the giving of the Torah to Israelites by God. The period is known as the Counting of the Omer, and Lag B'Omer falls on the 33rd day during that period. One explanation for the joyousness is that it signaled a break in the plague that killed thousands of rabbinic scholars in Palestine during the second century, and another is that it pointed to Jewish military achievements against the Romans. During the Counting of the Omer, there are mourning practices relating to the plague but they are lifted on Lag B'Omer. It is a day of picnics, marriages, song, archery games, and bonfires. Three-year-old boys get their first haircuts on that day. People in Israel make a pilgrimage to the burial place in Galilee of Rabbi Shimon bar Yochai, who allegedly authored the Jewish mystical text called the Zohar and died on Lag B'Omer. The Djerba festival has features that are colored by North African religious expressions, according to Jane Gerber, professor of Jewish history and director of the Institute for Sephardic Studies at the City University of New York graduate school. She said that along with the picnics and bonfires, the day in the Middle East and North Africa has been traditionally a time of pilgrimage to gravesites of pious people. She said the day serves as a "pause" in the mournful period and has "taken on its own special quality of holiness and joyousness." "It's a break in all that solemnity," she said. "it's joined with the local indigenous customs of visiting tombs of righteous or learned rabbis." She stresses that the Djerba event is a form of regional Judaism, promoting nostalgia and ethnic revival. "It is characterized by a carnival-like celebration," she said. Lag B'Omer festival resembles a "big feast holiday," says Isabelle Miller, a Philadelphian whose family has Tunisian Jewish roots. She has been to the Ghriba synagogue but never to the Lag B'Omer event. Nevertheless, she was able to say the event is a "very big deal" in the Tunisian Jewish community. "The Ghriba is very interesting," she said, noting that with a Tunisian flag on top, it's like a "national monument." "I would call it a shrine," she said. In Djerba, the event celebrates the fruits and hopes of spring. There's a procession, a festival, and an auction to help the local Jewish community. Women will place eggs in the synagogue to pray for fertility. It is a celebration of a Jewish culture - distinct in its food, clothing and jewelry, and one that has long mixed amicably with other elements of the population, which includes Muslims and the Arab and Berber ethnicities. "It deals a lot with the springtime and spring harvest, the life cycle of the spring rebirth, and the abundance of spring planting," Sorkin said. Men and women mix together to celebrate, a dynamic not seen on other days of the year. "This is one day it's almost like Mardi Gras," Sorkin said. Many observers say that Jews and Arabs mix well in Tunisia and there's national pride from and toward the island's ancient Jewish community. "Tunisia, as well as Morocco, has been one of the unique countries in the Arab world that has been very forthcoming toward Jews and Jewish practices," said Stan Urman, executive director of the American Sephardi Federation. The Jews have the right to react the way they have done. They are even too kind to accept the little land space called the state of Israel. What God gave them thousands of years ago was larger. Christianity is a branch-off of Jewish faith. If Jews reject their past then christianity will become abysmal. Everything should be done to allow them celebrate their God, for God is one. We had planned to go to Tunisia on a tour this past winter. Our tour was cancelled at the last moment because of the unrest. Regrettably, Tunisia is no longer hospitable for those of us of the Jewish faith. It would have been a nice trip, but I do not think that my wife and I would be welcome in Tunisia at this point in time. Other Jews have gone to Tunisia in the past and have enjoyed it and felt very comfortable. It is sad. Thanks for the only informative comment in this thread. well it appears most of this forum has turned into a Palestine v Israel debate. My opinion? It was irresponsible and wrong to just slap a jewish state down right where millions of Arabs were already living. There is no way that could ever work without causing a ton of conflict. Jews were already living in Palestine and were happy enough to do so, living in their former state. all you needed to do was makesure they were protected within palestine. Now, you have millions of displaced arabs angry about the loss of their homes, and, believe it or not, they aren't very happy with the people that are responsible: Jews and their allies in the west. It's like blaming the Native Americans for attacking the settlers that were claiming their right to native land. Unfortunately, the nation of Israel is here now, milllions live there now, and they are not leaving without a fight, so to force the destruction of the state would be to incite even more ruinous conflict. A dual state, i think, is the only viable solution. that and the end of the Jewish settlement projects. Neither Israel or the Palestinians is right or wrong here, so we must compromise. If by dual state you mean one which is equally Israeli Jewish and Arabic Muslim then you gonna get just the sort of trouble you're seeking to avoid. The wolf shall not dwell with the lamb. The only right thing to do in this case is leave it the way it is. I'll remind you that 700,000 arab muslims were displaced (overwhelmingly by their own choice) whereas 900,000 arab jews were expelled from arab countries and made Israel their home and all this happened more than 60 years ago. What's done is done and no need to try to fix whats not broken. What the Jews need is acknowledging Jesus of Nazareth as their Messiah-God. No one else can help them since God has already sent His Son, the Savior of the world, to the Jews. Read Isaiah chapters 52 and 53 and elsewhere as well. The nation of Israel never suffered innocently like that. No nation is guiltless. God faithfully kept His promises for the Jews and for all mankind. The Jews must respond to Him now as they should. The Jews are awaiting their Messiah for thousands of years. If and when Jesus of Nazareth will come and PROVE that He is indeed the Messiah the Jews will gladly accept Him. @Thinker23: Jesus DID that already, but the Jews did not accept it. They are somewhat similar to atheists in that sense – deniers of proofs, but they will all believe in Jesus eventually. Arelina: A PROOF must be convincing enough to make people believe in it. The very fact that the Jews at the time were not convinced means that the proofs offered by Jesus were not convincing enough. Considering how many false Messiahs declared themselves throughout the years you can hardly blame them. By the way ,only two days ago a couple in the US declared that they were Jesus and Mary. Did you accept them? Thinker23: ??? All the initial Christians were Jews and there are many Jews who believe in Jesus today. I mean the whole nation of Israel must believe in Jesus very soon. Jesus of Nazareth alone was the true Messiah whom God had promised in OT and whom He sent. We know it by the countless fulfilled prophesies. Jesus will return from the sky. America is not included in OT; anything in America has nothing to do with the prophesied Messiah except it has a lot of believers in Him. Therefore, responding to missionary tactics should be done in person rather than public online boards, or one-on-one with Jews whom they have taken and who need to be shown the truth. Adelina, this "Jesus" or more accurately Yehoshua/Yeshua was nothing more than a mere man. Get it through your head that your blasphemous beliefs deny Hashem's place in the universe, reduce him to man, and inspires the polytheist beliefs of the "Trinity" of three gods, and not one. Also it promotes idol worship, or as you call it praying to "saints", your heresy of Christianity has the GALL to tell the true followers of Hashem that they are on the incorrect path. It is insulting on top of the whole injuries, murders, massacres, forced conversions, the Shoa that you "revenge" this Yeshua's blasphemy and death at the hand of ROMANS, instead blaming Jews. Yeshua was a Jew, blasphemous and heretical if what has been written about him is true. He is certainly NOT the Moshiach, the Messiah, he committed a huge infraction against the holy practices of the Temple in Yerushalayim (yes you should learn Hebrew since that is how G_d gave the Law and its tenets in the Tanakh (what you mistakenly call the "Old Testament") there is only ONE BOOK for the Jews. For that, if what your "gospels" say is true, he was then handed to the Romans as an actual rebel, not just a spiritual one, and executed just as many many Jews and countless others who suffered cruel death under the Roman yoke. Christianity is nothing more than a twisted Jewish heresy fouled by mixture with Greco-Roman thought and pagan practices. You do and others HAVE NO PLACE TO CONDEMN OTHERS, since you are heretics and follow deviations against the Lord, against the commandments. So do your homework and praise and tolerate those who maintain the true faith in Hashem. Maybe try to read Isaiah in it's original language, Hebrew, and then you will get a better understanding of what the text actually means! This is not true. A PLACE named Palestine was (and still is) on maps for hundreds of years just like Siberia, Europe or Sahara. There was no COUNTRY named Palestine just like there was no country named Siberia, Europe or Sahara. Thinker you are incorrect. THERE IS NO "PALESTINE"
"Palestine" is from Latin "Palaestrina" – Philistia. The Philistines disappeared from history in 701 BCE when the Assyrians invaded the region. The Romans used this false name in their failed effort to ethnically cleanse Jews from their homeland the LAND OF ISRAEl. There is no "Palestine", every Jew and any person who truly knows the history knows that this is Eretz Yisrael, the land given by Hashem. If these so called Philistines claim a link to the land (which is utterly false) , the only land they could evenly remotely claim is Gaza, which is where the real Philistia existed. And they are not even remotely related. These so called Filastines are Arabs who are mostly not even remotely from Israel including Judea, Samaria, Galilee, Gaza. If we'll throw out the stone tablets will they stop throwing regular stones (and missiles) at us, in your opinion? To hawaiiduude: The Jews are not going anywhere. Even if the Jews disappeared the Arabs would immediately find other reasons to kill Americans, Europeans and each other. Just like taking away some of the meat in tiger's diet would not make the tiger a vegetarian. Yes, the Jews are holding the dam from spilling for now. All nations will pay for their evil deeds. You need to throw out the stone tablets and get with the 20th Century, it is nice to dream but many of the so called Holy Men a long time ago were very sick liars. The better alternative is to stick to philosophy in general. If you have evolved beyond belief, then why are you on a Belief Blog website? Furthermore, we are in the 21st Century… you need to get with the program. We're never "throwing out the stone tablets" or doing away with a single commandment or even a single letter of our holy Torah. It has kept of going for over 3,300 years, and it will continue to keep us going until we bring mashiach and G-d once again reigns in a fully open and revealed way from Jerusalem. Us Jews are here to stay – and here to stay as proud Jews – and if you have a problem with that, you'll have to swallow your pride and live with your problem. Why should they do that? Why does their thousands old beliefs need to be put away at all? They are not violent. They do not bother anyone.. these Jews just quietly celebrate their heritage. It is a beautiful thing and not something to be put away because others are ashamed of their culture and have thrown their own history and rituals away like so much garbage. Personally, I find it disappointing the situation doesn't permit North Africa's Jews to make their pilgrimage in safety.